Tsukioka Yoshitoshi (1839–1892), “Picture of the Great Battle of Kawanakajima and Picture of the Bloody Battle of the Brave Generals of the Takeda Clan,” 1866 and 1867, woodblock print hexaptych, 14-1/8 by 59¾ inches. Courtesy Scholten Japanese Art. NEW YORK CITY — On March 9, Asia Week New York throws open the doors to the largest number of privately curated exhibitions in the event’s history — a total of 50. Asia Week New York is the annual ten-day presentation of treasures from all over Asia, a magnet for collectors, museum curators, designers and scholars that is certain to satisfy. 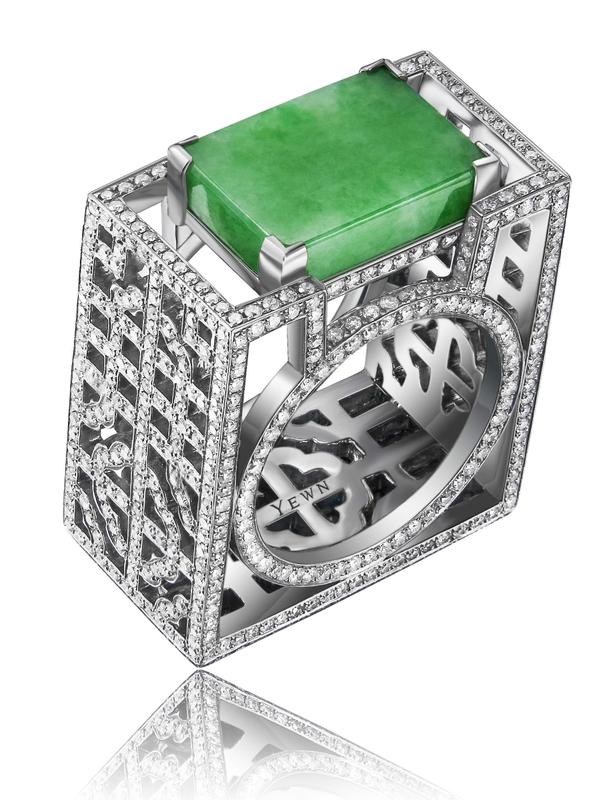 From every corner of the continent of Asia comes an array of beautiful things to be seen and savored at galleries sprinkled around Manhattan beginning March 9 through March 18. In these displays by knowledgeable and discerning Asian art specialists, art lovers will be able to behold examples of painting, sculpture, bronzes, ceramics, jewelry, jade, textiles, prints and photographs. 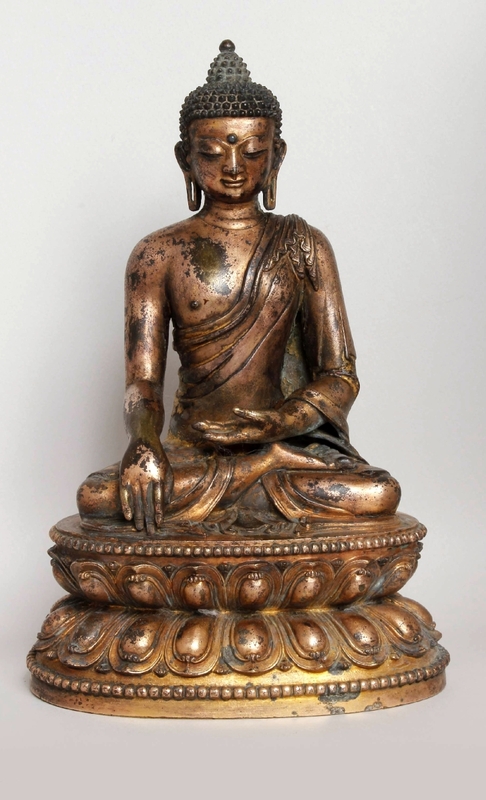 Buddha Shakyamuni, copper alloy with remains of mercury and lacquer gilding, China, Tibeto-Chinese style, Yuan, early Fourteenth Century, 9.37 inches high. Courtesy Dr Robert R. Bigler. Walter Arader Himalayan Art (New York) — Claiming a special place in recent acquisitions at 1016 Madison Avenue is a gilt-lacquer Chinese sculpture that likely originated during the Reign of Kangxi (1661–1722). The work once belonged to a set of 12 retinue figures that accompanied a larger sculpture of Shri Devi Magzor Gyalmo. Ralph M. Chait Galleries (New York) — A key element in “Spring Collection of Chinese Art,” and standing 17 inches is a famille verte porcelain rouleau vase decorated with a scene from the Chinese classic Romance of the Three Kingdoms. Dating from the Kangxi period (1662–1722), the painting is executed in deep and vibrant enamels and is on view at 16 East 52nd Street, tenth floor. 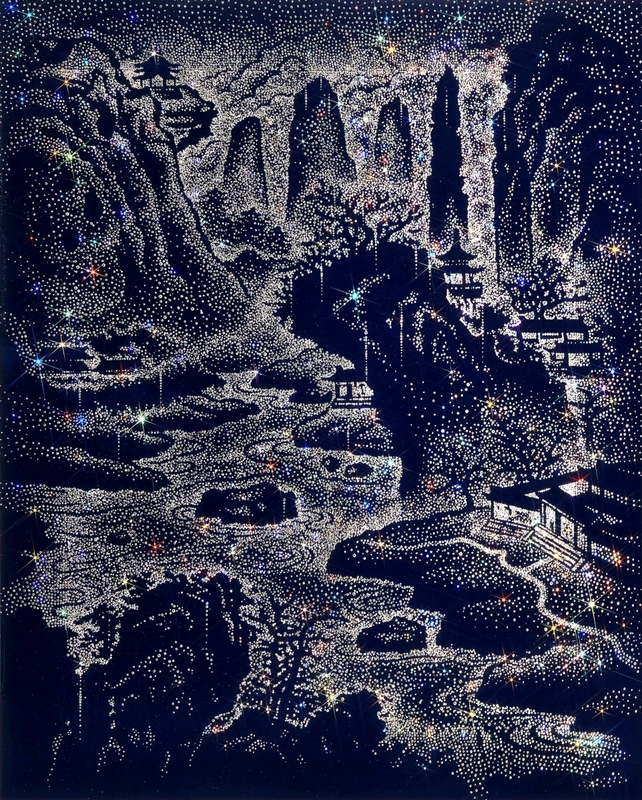 Kaikodo LLC (New York) — A standout in the exhibition “River of Stars,” a poetic term in Chinese for the Milky Way, is a Fifteenth–Sixteenth Century masterwork — a bird and flower painting, measuring 5 by 10 feet, which can be seen at 74 East 79th Street, Suite 14B. Dr Robert R. Bigler (Ruschlikon/Zurich, Switzerland) — Although the 9½-inch Buddha Shakyamuni evidences some wear and signs of age, the quality of its casting shows details that are exquisitely modeled. A thermoluminescence test on the work confirmed a dating to the early Fourteenth Century. This figure is part of the exhibition “Dynasties and Identities, Tibeto-Chinese Buddhist Art of the Thirteenth to Fifteenth Centuries” at Dickinson Roundell Inc, 19 East 66th Street. DAG Modern (New York) — A portrait on cement by Ramkinkar Baij (b 1922) of Rabindranath Tagore, the first non-European to win the Nobel Prize in literature, was executed in 1938. The likeness of Tagore is part of “The Art of Bengal,” 41 East 57th Street, Suite 708. 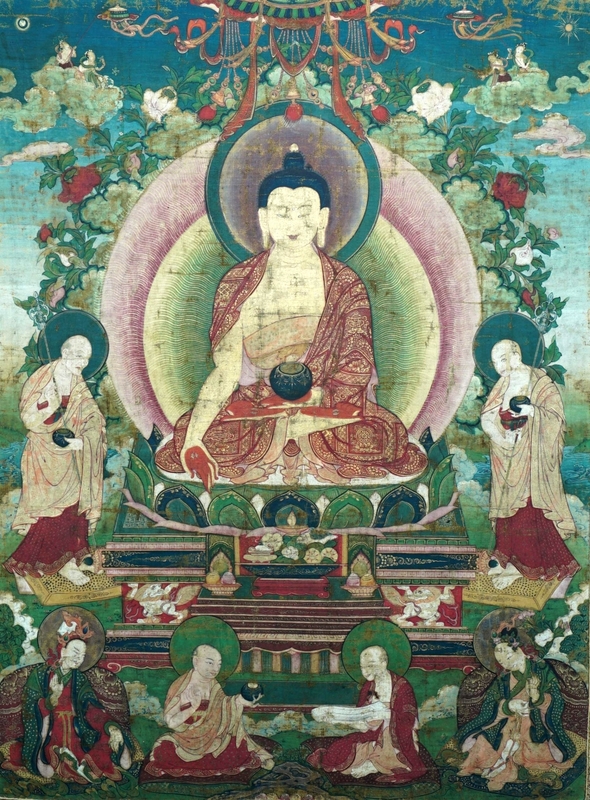 Sino-Tibetan thangka, 24-7/8 by 18½ inches, ink, pigments and gold on cotton cloth, anonymous artist, Eighteenth Century. Francesca Galloway (London) — Showcased in “Pahari Paintings from the Eva and Konrad Seitz Collection” at W.M. Brady & Co., 22 East 80th Street, is an unforgettable painting of Vishnu’s feet as objects of worship. The footprints of Vishnu (Vishnupada) are important symbols in Vaishnavism, and places where his feet came down to earth are sacred. The soles of Vishnu’s feet are decorated with gold images of his weapons and other symbols associated with the deity: lotuses, a parasol, a flag, the sun, the moon and a fish, among other things. The Art of Japan (Medina, Wash.) — “Japanese Prints and Paintings from 1750–1950” is an exhibition in Suite 215 of the Mark Hotel, 25 East 77th Street, and “Beauty Combing Her Hair” is a must-see. Dating from 1933, this image, by Torii Kotondo, elegantly conveys the quiet essence of the Japanese ethic of shibui — less is more. The beautiful woman, lost in quiet thought, arranges her hair and communicates fluently the formal simplicity of the image. Dai Ichi Arts Ltd (New York) — In “The West in the East,” 18 East 64th Street, Suite 1F, a work by Miwa Ryusaku (b 1940) is singled out for special appreciation. Titled “Love,” this stoneware sculpture stands almost 14 inches tall. It comes in a wooden box, signed on the back by the artist. Joan B. Mirviss Ltd (New York) — “Eight Views of the Parlor,” circa 1766, is a midsize woodblock print with exceptional color and is by the woodblock print master of that era, Suzuki Harunobu (1725–1770). The work, from his series “Zashiki hakkei, depicts a courtesan seated on a verandah wearing a yukata (bath robe) and gazing at an unusual and expensive clock while her attendant massages her back. It is one of the many works in this exhibition, “Timeless Elegance in Japanese Art: Celebrating 40 Years” at 39 East 78th Street, fourth floor. This mixed media work was created by South Korean artist Jongsook Kim. In her “Artificial Landscape” series, she applies hundreds of shimmering elements crystals to the canvas by hand. Courtesy Kang Collection Korean Art. HK Art and Antiques LLC (New York) — Working in Seoul and Paris, Tschangyeul Kim (b 1929) is a well-known artist in Korea, the United States and France. His unique untitled oil on canvas painting of 1968 dates from the middle period of his career, before he started painting water drops. Acquired from a private collection in the United States, the painting is part of an exhibition titled “Nature, Rocks, Flowers, Water and Clay” at the Jason Jacques Gallery, 29 East 73rd Street. Kang Collection Korean Art (New York) — A mixed media work by Jongsook Kim is not to be overlooked. In her “Artificial Landscape” series, Kim applies hundreds of shimmering crystals to the canvas by hand, a meditative process for the artist that transmits to viewers. Kim’s effort is a prominent part of “Korean Contemporary Paintings and Decorative Traditional Arts,” 9 East 82nd Street, third floor. Tina Kim Gallery (New York) — An entire exhibition at 525 West 21st is centered on the arresting work of artist Seoyoung Chung. In pieces that explore multiple methods of practice in sculpture, installation, drawing, photography, text and video, objects not ordinarily considered sculpture reveal themselves as just that. With “Table,” constructed from wood in 2007, Chung isolates the moment in which such a “sculpture” emerges into the world. For additional information, www.asiaweekny.com. A full list of participating galleries and highlights is available there.